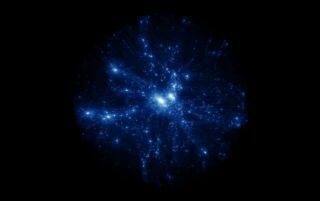 This still from a NASA video shows a snapshot of the universe as simulated by NASA's Pleiades supercomputer, the seventh fastest in the world. The Bolshoi universe simulation is the most realistic view of the universe to date and was released in late September 2011. The universe is a big place, near-infintely big, but there's a structure to our cosmos that astronomers are hard at work unraveling. Take a tour of some of the out-of-this-world structures that make our universe tick in this video show, "A Blueprint for the Universe," the first stop in SPACE.com's eight-weekday series to look at our universe's mysteries entitiled: The History & Future of the Cosmos. It took quite a bit more than seven days to create the universe as we know it today. SPACE.com looks at the mysteries of the heavens in our eight-part series: The History & Future of the Cosmos. This is Part 1 in that series.